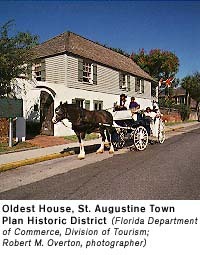 The St. Augustine Town Plan Historic District, a National Historic Landmark, encompasses the site of the oldest continuously occupied European and African American settlements in the United States. Part of Ponce de León's 1513 claim to La Florida, St. Augustine was the site of Spanish military base established in 1565 by Don Pedro Menéndez de Avilés. The town of St. Augustine soon grew around the fort and became the seat of Spanish power in Florida. During the 16th, 17th and 18th centuries, free blacks and slaves found Florida a haven--the Spanish Crown granted refuge to blacks if they embraced Catholicism. Today the district retains the distinctive plan typical of a 16th century Spanish Colonial walled town. The colonial buildings in the district date from 1703 to 1821 period. Among the most noted buildings in the district are the Plaza de la Constitución, the colonial community's focal point (King Street), the Oldest House, a traditional Spanish Colonial residence built circa 1706 and the oldest surviving residence in St. Augustine (14 St. Francis Street), the Basilica Cathedral of St. Augustine, which incorporates the 1797 parish church and is one of the oldest Catholic religious buildings in the U.S. (36 Cathedral Place), the 1883 Villa Zorayda, an exotic Moorish Revival residence with courtyards and towers (King Street), and the Gothic Revival style Stanbury Cottage (St. George Street). The boundaries of St. Augustine Town Plan Historic District are Orange Street, San Marcos Street, the Matanzas River, St. Francis Street and Cordova Street. For more information contact the St. Augustine and St. Johns County Visitor Information Center, located at 10 Castillo Drive. Open daily 8:30 a.m. - 5:30 p.m. (904) 825-1000.